The popularity of outdoor living shows no signs of slowing down in 2019! During the past decade, we’ve seen a huge growth in the outdoor living industry, with innovative and low-maintenance decking and outdoor living products growing in popularity, fueled by homeowners desire to unwind, relax and disconnect from their digital lives. Outdoor living spaces allow us a chance to spend time with friends and family, enjoy nature, and decompress. Here are some of the top trends we see dominating outdoor living in 2019! As younger generations of homeowners purchase and renovate their homes, they’re seeking out eco-friendly and sustainable alternatives to wood. 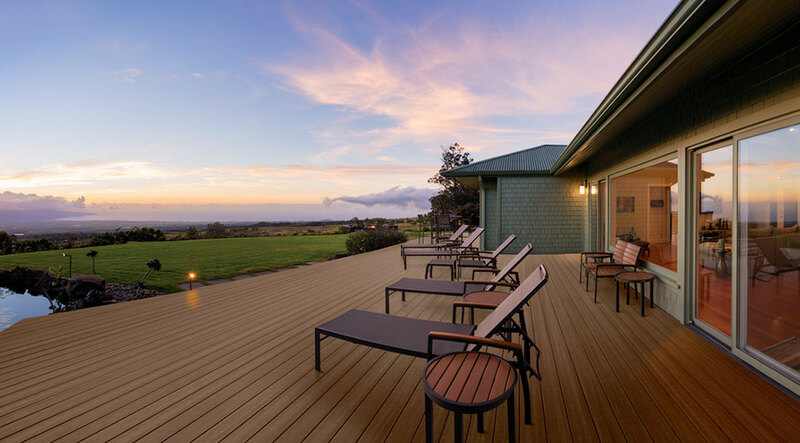 Composite decking products offer the same appeal of traditional wood, but outperform it with regards to durability, less maintenance, and less of a harmful environmental impact. Many great decking products like Trex are made from 95% of recycled and reclaimed materials, diverting millions of pounds of bags, plastic and other garbage from landfills, creating a durable decking product that’ll last for years to come. With precious little leisure time, New Jersey homeowners are seeking out low-maintenance decking materials for their outdoor living spaces. For that reason, wood alternatives (particularly composite products) are high in demand. Unlike wood, these high-performance products require minimal maintenance – they resist scratching, staining and mold. They won’t rot, splinter, crack or warp. You won’t need to sand them, painting isn’t required and if you spill food or drink on your deck, simply wash it away with soap and water. In 2019, homeowners are looking for a low-maintenance solutions. Nobody wants an outdoor space where they spend more time maintaining and upkeeping than enjoying! Low-maintenance decking products deliver the aesthetic beauty of wood but lack the time consuming upkeep. Look for modern and energy-efficient lighting integrated into deck sconces, posts, step lights, and post caps. Built-in lighting can increase the beauty of your outdoor space and make your outdoor living space safer after dark. Comfort is key to a great outdoor space. Clean, minimal looks are becoming more popular, with homeowners focusing on quality over quantity. Think a cozy, comfy haven with throw blankets, plush cushions and fire pits and patio heaters for warmth. For outdoor living spaces, clean lines are popular, with simple styles that include durable, long lasting products for an overall cozy, uncluttered feel. Homeowners are also thinking more long-term when it comes to accessorizing their outdoor space, and opting for quality products that are long-lasting and durable. The modern aesthetic of streamlined aluminum railings are popular, as are outdoor cabinetry options with built ins like ice chests, trash bins and color coordination to seamlessly blend into deck design. Built ins like these are another growing trend we can expect to continue! Even if you own a condo or townhome with minimal yard space to accommodate a large deck, a rooftop deck may still be an option! If your yard or house isn’t configured for a deck attached to the home, a freestanding decking option may work perfectly for you. A freestanding deck is a great way to add more outdoor living space in your back yard. Design Your Dream Deck Today! As the heart of the home shifts to outdoors, Builders’ General offers high performance, low-maintenance decking options from top brands like Trex, Azek, and Timbertech. As it warms up in New Jersey, homeowners are eager to enjoy more time outdoors. Looking to kick off your decking project? A professional from Builders’ General can guide you every step of the way. Contact us for a free consultation and we’ll get you on the right track towards a fantastic outdoor space.